Cold Pursuit, Hans Petter Moland’s remake of his Norwegian crime thriller In Order of Disappearance (2014) is a darkly comic film, suffused with violence, that is as likely to evoke extreme laughter as it is severe revulsion, and possibly both simultaneously. Set in the fictional resort town of Kehoe, not far from Denver, Colorado, craggy mountain peaks and vast expanses of snow are the backdrop for a brutal story of revenge and the epigenetics of violence. Ever since Taken (2008), in film after film, Liam Neeson has honed an onscreen persona as a man of action rather than words. 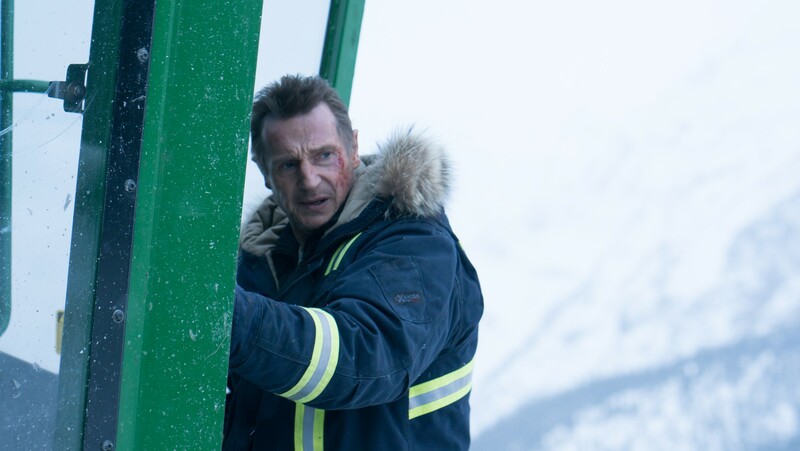 In Nels Coxman, a modest snowplow driver, Neeson takes the character to an expressive extreme, with a soulful, wounded look in his eyes as he goes about avenging the death of his son with chilling pragmatism. When 20-something Kyle (Michael Richardson) is found dead of a heroin overdose, mom Grace (Laura Dern) is not only grief-stricken, but horrified at the thought that they really did not know their son at all. But Nels refuses to take Kyle’s death at face value, insisting that Kyle was not “a druggie”. 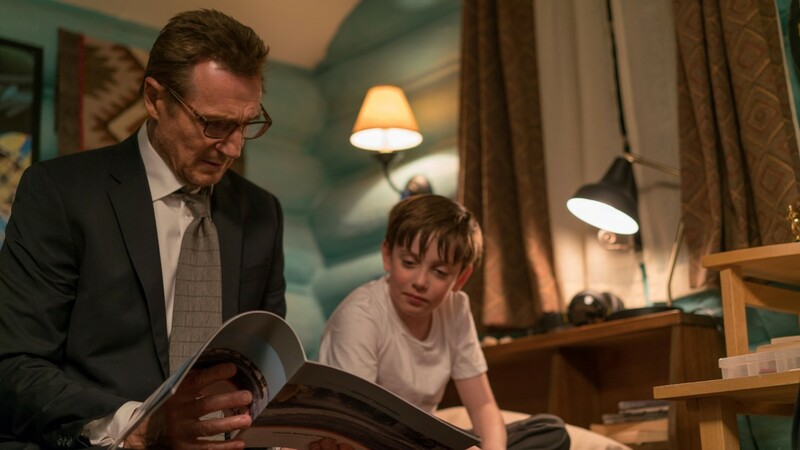 The recent revelation of Neeson’s own racist revenge fantasies somewhat diminish this writer’s enthusiasm for the actor, yet this does not detract from the film’s merits. Perhaps this occasion of life as a mirror to art is a timely reminder that as one follows the brutal rampage in the film, amid the gales of laughter at its deadpan clever humor, its worth considering the sources of that violence and the film’s not all that subtle critique of violence as something that is learned in the home. As the film cuts from Grace and Nels cozy cabin in the mountains to scenes in the life of crime boss Viking (Tom Bateman), it is apparent that despite the differences in preferred décor – Viking resides in the minimalist splendor of a glass fortress – there are parenting lapses on both sides of this story. 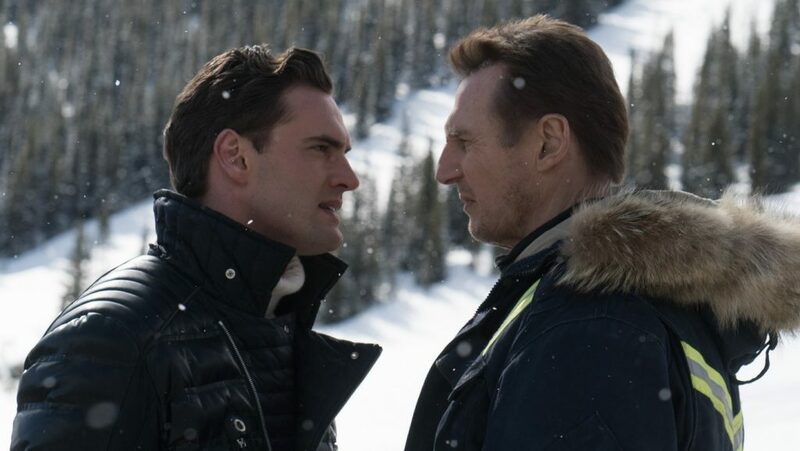 Yet the film’s narrative arc focuses primarily on the body count, with Cold Pursuit employing the same conceit of noting each successive death with the character’s name, nickname and a symbol of their religious affiliation on a black screen. Tension and violence are juxtaposed with a sense of the absurd, and the experience of being jolted from the suspenseful brink of emotion to hilarity is fun, as long as one does not think about it too much. Somewhat reminiscent of Fargo, Cold Pursuit features Emmy Rossum, who lights up the screen as Kim Dash, an eager young police officer paired with a curmudgeonly, jaded partner. Yet unlike Frances McDormand’s character, Kim resorts to disappointing sexual manipulation in her pursuit of justice. Racist stereotypes are abundant as the plot twists and thickens, bringing in White Bull (Tom Jackson) and his Native American clan. Moland works the misogyny and racism in a manner similar to the violence; it is at once an off-putting display, and a critique of sexism, racism and cultural appropriation. In this bloody saga of fathers and sons, there is a ray of hope in the sweetly nerdy Ryan (Nicholas Holmes). Despite the best efforts of his cruel and foolish father Viking, Ryan appears to be growing up relatively unscathed, with his humor and common sense intact. Perhaps even when nature and nurture conspire to do their worst, the future is not so bleak after all. Director: Hans Petter Moland; Screenplay: Frank Baldwin, based on the movie “Kraftidioten” written by Kim Fupz Aakeson; Cinematography: Philip Øgaard; Editor: Nicolaj Monberg; Music: George Fenton; Cast: Liam Neeson, Tom Bateman, Tom Jackson, Emmy Rossum, Domenick Lombardozzi, Julia Jones, John Doman, Laura Dern.